Getting a car out of impound is almost never easy. It would almost seem as if the impound lot goes to great lengths to make it as difficult as possible. The causes of impounding a vehicle could be any number of reasons. After waiting in excruciatingly long lines, many people do not have the funds and or paperwork to get their vehicle out. So what does it take to get your car out of impound? Not knowing where your vehicle is at is definitely a possibility when it comes to a vehicle being impounded. It really depends on your situation. If you were arrested and your vehicle was impounded at the time of your arrest, most likely the police gave you the impound lot information. 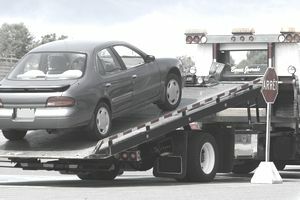 If your car was towed without your consent, you may be at a loss of where to even look. Call your city office building and ask the clerk to look and see if your vehicle was recently listed as impounded. If you were parked illegally, check for signage in the area stating where they have vehicles towed or ask the business you were parked nearest at the time of the tow. Still Can't Locate Your Car? The lot does not instantly have your vehicle on file at the time of the tow. Give it some time and call again after a few hours have passed to find out if your vehicle is listed as being in their lot. Your car may have been stolen! After thoroughly looking for your vehicle at tow yards and impound lots, it might be time to notify the police of your vehicle being stolen. A stolen vehicle is definitely a serious situation, but its no fun to contact the police just to find out your vehicle has been impounded and not stolen. Every single day your beloved car is locked up in the impound lot, you are racking up very expensive fees. I can't really give out specific dollar amounts on the rates because its going to vary so greatly all across the country, city lots can be different from privately owned lots. Nearly all impound lots charge by the day. So the faster you get your paperwork together, the faster you are going to stop bleeding money. Ask a friend or family member who owes you a favor. Last resort look for a Pay Day Loan Office or get a line of credit. The line at the impound lot can often be unbearable. The worst case scenario is you wait what feels like forever just to find out you did not bring the paperwork you need or you do not have enough money to get your vehicle out. The best way to ensure you will get your vehicle out is to call ahead of time. Great preparation is the key to a smooth pick up. Find out if your car is located at the lot. Ask about the lot's opening and closing times. Find out how much you owe given the day of pick up. Get the lot's fax number if you prefer your insurance carrier to fax your proof of insurance on your behalf. If you show up without one of the necessary pieces of information, you will be sent home without your vehicle. Makes me think you might not want to be dropped off at the impound lot without confirming you get your vehicle back. Plan on your ride waiting along with you, even if the line is long. It is a much better option than being stranded without a ride. Proof of car insurance is going to be important in getting your vehicle back. It will have to be a current and active policy identifying the vehicle in impound as being insured. Proofs of insurance usually state the insurance carrier, the named insured, policy effective dates, year, make, model, and VIN, Vehicle Identification Number, of the vehicle covered by the policy. Some states allow for electronic proofs of insurance to be used to provide proof to police officers when pulled over and even at your local DMV, Department of Motor Vehicles. If you are considering using electronic proof of car insurance to get your vehicle out of impound, it is best to contact the impound lot before hand to verify if it is acceptable. If you do not have car insurance on your impounded vehicle, and it is a requirement, you are going to need to get it. In some states, not having car insurance on your car could be the cause of your impound troubles. Getting car insurance after going without for any length of time can make things somewhat difficult and likely expensive in most states. Uninsured drivers are often considered high risk drivers. High risk drivers have a more difficult time getting car insurance, usually because it can be so expensive. Shop Around for Car Insurance: Yes, I know time is of the essence, but you do not want to accept your first car insurance quote. Get a minimum of three to help get the best deal. Look for insurance agencies who specialize in high risk drivers. You will often get better service because the agent will be more interested in you as a customer. Many preferred agencies will write high risk policies, but they often give the best customer service to their preferred good risk drivers which often make up the bulk of their clientele. Online car insurance is an option, but make sure you research coverage and be sure to speak with a representative if you have any questions about your policy. Discounts: Just because you are a high risk driver, does not mean you do not qualify for car insurance discounts. Ask the quoting agent about the discounts they offer. Many provide discounts for senior citizens, home ownership, miles driven to and from work, being a member of a credit union, and more. What Coverage Do I Need? : Well, the impound lot is going to require your state's minimum car insurance coverage at the very least. It does not mean that is the best coverage for you. Any good car insurance agent will tell you the state minimum coverage is not enough. It may not make sense, but sometimes purchasing the preferred higher limits of 100,000 / 300,000 of liability is actually cheaper. Choosing the preferred higher liability limit is sometimes rewarded with a better rate. It is worth checking different coverage amounts to make sure you are getting the best possible coverage at the best possible rate. SR 22 Insurance Filing: If you are trying to get your driver's license reinstated amid this process, you will also likely need to request a SR 22 car insurance filing. Basically, the filing connects your car insurance with the state so the state will receive notifications whether or not your policy is active. A SR 22 filing is fairly inexpensive, usually running under $50 for six months. Get the filing added to your new car insurance policy, then get your driver's license reinstated, then go get your car out of the impound lot. Choose the Best Payment Option: Car insurance policies come with a lot of different payment options. Choosing the best one can save you a lot of money. Paying in full is often a great option because it usually comes with a hefty discount, but not very many people can afford it. Most all insurance carriers offer a discount for choosing automatic payments. Selecting automatic payments from your checking or savings account will not only save you with a discount, but it often will save you a payment fee, possibly even a late fee, and best of all you often get a lower down payment. Get Proof of Insurance Once You Make a Down Payment on Insurance: What you really want in this process is of course to be insured, but right now you need that proof of insurance to get your car out of impound as soon as possible. Car insurance can be purchased over the phone with a local agent or online through a direct insurance carrier. Request your new insurance agent to fax the proof directly to the impound lot if you can not get a printed copy directly in your hands. Remember every day wasted, is more money out of your pocket. The faster you take care of the items listed above, the less money this situation is going to cost you. Getting your car out of impound fast is going to be decided heavily on whether or not you have the cash to make it happen. Get your finances in order and follow the steps laid out above and you should have your car out of impound relatively fast.